Trappro humanely removes groundhogs that have invaded your yard, shed, under porch or house or other areas of your home. Groundhogs are active in the Fall as they dig burrows to hibernate for the winter.Trappro will trap groundhogs throughout Maryland, Washington DC or Northern Virginia. Call Trappro today to get rid of groundhogs. Description: Known for their burrowing abilities, groundhogs are large rodents (larger than the average cat) fairly exclusive to North America although they inhabit some parts of Canada. They can measure up to 2' ft. long with a 6" long tail with a weight of 5 or more lbs. Their short limbs are a very powerful digging tool when paired with their sharp curved claws. Groundhogs will burrow for sleeping purposes, rearing young or hibernation. Most burrows have two or more entry/exit points to avoid predators and attain a quick escape if needed. They are typically active during the daylight hours but go in to hibernation in late October until March or early April. 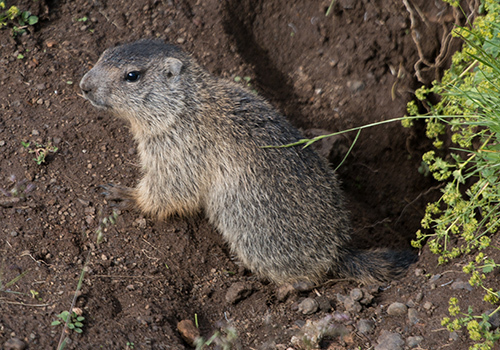 Groundhogs are not communal animals, but multiples can be found in burrows for warmth. Food Sources: Vegetation of many types is the main food source for this large burrower. Groundhogs will feed on berries, shrubbery, grass, farm/garden crops, flower beds, and even small insects when needed. Most of the greenery they consume takes care of their water needs. Life span & reproduction: Female groundhogs usually breed after the first or second year of life. Breeding season begins in March or early April. After fertilization, the mates stay together in a shared burrow for the 30 day or so gestation period. After the young are born (about 2 to 6) in April or May, the male leaves the den. Young groundhogs are born like many other young mammals; blind, hairless, and helpless. After five to six weeks, the young have gained sight & independence, weaned off their mother's, and are in search of their own dens. They can live for up to 6 years in the wild, but 2 or 3 years is average life expectancy. Typical areas of Entry: Groundhogs search for an entry point in to any structure to gain entry for warmth, shelter or breeding purposes. A large number of Groundhogs invasions occur during breeding season because females are searching for a nest to birth and grow their young. Ground level openings are the main concern as we rarely see Groundhogs in an area above ground, although they have climbing abilities. Groundhogs are partial to entering, but are not limited to entry through: Unscreened ground level crawlspaces/vents, open or damaged crawlspace doors, under sheds and hot tubs, and even directly beneath the foundation. Groundhogs will be urinating & defecating in the areas they habituate (ground level crawlspaces). The crawlspace will become soiled and an odor is likely to be profound due to the excrement & debris. Groundhogs can unsettle a structure's foundation because of consistent burrowing. Typical treatment: First, a thorough inspection by a Trappro technician will be completed, area(s) of entry will be identified, and typically, Trapping/Removal for approximately 3 to 5 business days will be our first line of defense. Live cage traps will be set near the entry/access points. The open areas where the groundhog(s) have gained entry will be monitored for activity during the duration of the trapping service. The technician will be placing a breakable barrier/screen/tape (whatever is available) over/inside the holes or entry points to monitor the groundhog(s) movements in and out of the open areas. This technique allows us to record wild life movement & will assist in dictating the duration of the trapping service. Once a point of no activity has been reached, Trappro will feel comfortable removing the live traps & installing temporary screenings over the existing entry points. The trapping/removal service along with our patch is guaranteed against animal re-entry for 30 days. Trappro recommends permanently sealing the groundhog(s) area(s) of entry. Upon the inspection, a proposal will be provided for permanent repairs to the home or structure. Trappro completes & warranties permanent repairs against wild life re-entry for up to 10 years. If groundhog are simply inhabiting or invading the yard with no specific point of entry, Trappro offers an Open Area trapping service for these purposes. Open area trapping is difficult simply because Trappro cannot force animals in to a trap; they must lead themselves inside before we are able to remove them from any property. Open Area trapping services last for a total of 7 business days (NO weekends or National holidays). Any animals/wildlife lead inside our traps will be removed. Trappro does not charge per animal or per trap. Dangers: The number one concern when dealing with a groundhog intrusion is the rate of transmitted rabies disease to these creatures. Rabies is the most highly transmitted disease with this type of wild life as with all mammals - and it can be easily transferred to humans and other animals with direct fluid contact (bite, scratch, etc.) NEVER approach a groundhog that is discolored, looks/acts sick or confused, hunched over, or appears to be lacking nutrients. Cats & Dogs should be vaccinated & kept away from these creatures. Groundhog excrement/droppings can also contain dangers such as roundworms, tapeworms, and various other parasites which are easily transferred to humans or pets. Our professional trappers will also be able to seal up areas in shed or under porch and home where groundhogs have entered the home. Trapping and exclusion of groundhogs is available for homeowners and business owners throughout Maryland, Washington DC and Northern Virginia.